PC gamers are tricky to track. Steam helps and gives some cool stats, but not all games are played through Steam. Raptr offers gamers the opportunity to track trophies and other achievements on PC, and gives some insight into what people are playing. As you can see, MOBAs reign supreme, grabbing the top two spots with World of Warcraft coming in 3rd. Most interestingly, WildStar has had an impressive launch, already coming in at the 6th spot – above Minecraft and World of Tanks. Similarly, I’m intrigued by the rise of Battlefield 3. It is most likely because it was free on the Origin store, but it’s still funny to see it within two spots of Battlefield 4. I wonder if, like COD: Ghosts, the older game will overtake the supposedly new-and-improved version. The Elder Scrolls Online is rapidly dropping, moving down 12 spots on the list. I wonder if it will even survive another month – reviews have panned the game and according to these stats, people are already returning to just playing Skyrim. I find it intriguing to see the longevity of some games compared to others. Many of these games have been out for years, but they continue to be popular compared to newer games that are already moving down (or falling off) the list. Dark Souls II has fallen off the list, although I’m surprised it was there to begin with considering that it was broken on PC at launch. 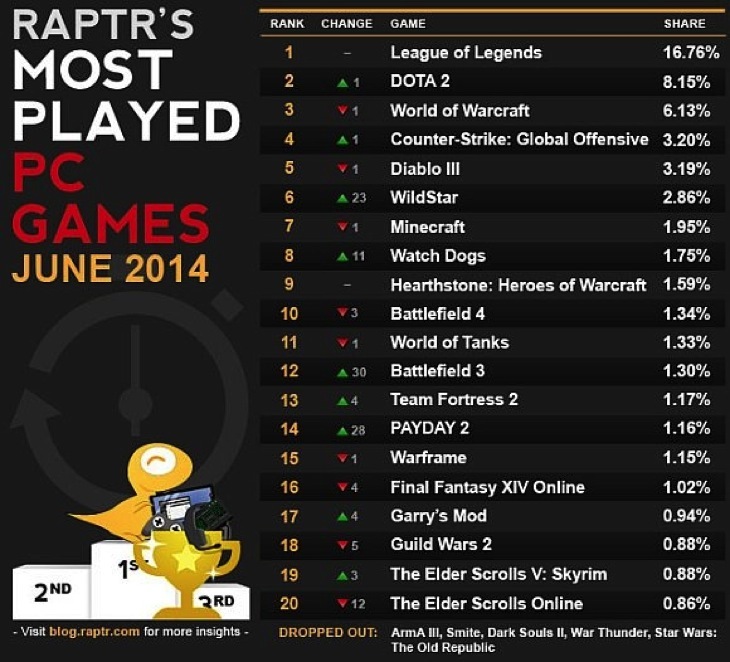 Watch Dogs is in the top ten for now, but I wonder how long it will be before people get tired of it and return to Mincraft or other standard PC gaming fare. At least we can already see that WildStar is being TESO in the MMO war; I wonder if it will usurp WoW’s spot in the coming months. Previous article Monday Box Office Report – Apes strong!